I knew just from the opening paragraph (quoted above) to: ‘The Book of Tea’, that I liked the Author, Kakuzo Okakura. His ‘world-weariness’ resonated with me as I paused to contemplate an evening in his company, perhaps at a ‘conversazione’, as the Italians say, where as guest of honour I could glean from his ‘wry’ take on life. Assure him that a Visionary was rarely acknowledged during his own lifetime, in my view, his time would come. The English often spring to mind when the subject is ‘Tea’ and clichés revolve around Royal Albert china services where cups are held aloft, little fingers at ninety degrees, cucumber sandwiches an essential, not a crust to be seen! Traditionally, it was the upper classes who would serve a ‘low’ or ‘afternoon’ tea around four o’clock to avoid that ‘sinking feeling’ before dinner at eight. The middle and lower classes would have taken a more substantial ‘high’ tea later in the day, at five or six o’clock, in place of a late dinner. The names derive from the height of the tables on which the meals were served, high tea being served at the dinner table. Behind the history of tea lies a dark and violent past, including smuggling, murder, and international incidents, like the famous ‘Boston Tea Party’. The British, in China itself, financed their tea dealings by the ruthless imposition of the opium trade and Moxham reveals a fascinating story in his page-turner: ‘A Brief History of Tea’. Notwithstanding the foregoing, the Eastern Philosophy retains a certain romance, enshrined within points of view between ethics and religion, man and nature. 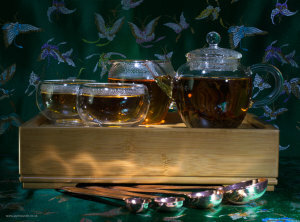 A literary figure from the Ming dynasty, Yuan Hongdao, wrote: ‘Tea drinking is the highest form of the art of life. Idle chat comes second and drinking last’; referencing the spiritual context the ceremony held within Chinese culture. The elegant term: ‘The Six Gentlemen of the Tea Ceremony’, is used to describe the accoutrements used, namely: Tea Spoon, Tweezers, Needle, Funnel, Scoop and Container, usually made of bamboo. To this day wild tea trees can still be found in the mountainous areas of southwest China dating back over one thousand seven hundred years. In Japan, the tea-room (the Sukiya) was designed as a humble place built from basic materials – a straw hut meant to be unimpressive in appearance. The early tea-rooms consisted of a portion of a drawing-room partitioned off with screens designed to accommodate not more than five people. There was no uniformity of design, considered fatal to the imagination; a fear of repetition led to no colour or design being used twice. Cleanliness was to be of the highest standard, alongside the beautiful and natural. In Japanese common reference we are informed of the man: ‘with no tea’ in him, meaning he has no sense of humour over the personal drama; whilst the individual who regardless of how mundane the tragedy goes over-the-top with emotion is one: ‘with too much tea’ in him, I think the modern expression would be ‘drama queen’ and I’m sure we’ve all known a few of those. Pre-eminently the tea-house was a place of peace and a Samurai attending would leave his sword outside on the rack beneath the eaves. He would bend low and creep into the room through a small door not more than three feet in height; a proceeding which was incumbent on all guests, ‘high’ and ‘low’ alike and intended to inculcate humility. Because the Taoist and Zen conception of perfection laid more stress upon the process through which perfection was sought, than upon perfection itself, true beauty could only be discovered by one who mentally completed the incomplete. Thus it was left to each guest’s imagination to complete the total effect of the tea-house’ place and form; its simplicity and freedom from vulgarity making it a sanctuary from the vexations of the outer world. Okakura was educated at a Christian school whilst growing up in Japan, which granted him the opportunity to write an Eastern perspective in English, of the West’s view of Japan and the hypocrisy of those sent to preach but who didn’t always practice was not missed by his pen. He felt dismay at the speed with which his fellow citizens were embracing the West and it caused him concern that the Japanese identity and artistic skills may be lost in the process. He spent a lifetime as Scholar and pivotal figure in the development of the Arts and for which he is remembered, alongside his other books.